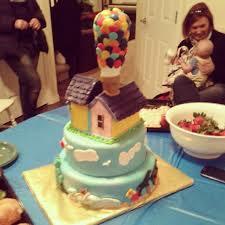 I like Up so much when I threw my dream party look at the cake I had made (it was an open house). So why do I love it so much? It’s tough but I will do my best to describe. Have you ever lost someone you love? Have you ever felt the pangs of regret that you wish you had said something or done something differently with the person who is gone? I certainly have and that is the message behind Up. It is what makes it special. It is what moves me so much. It is also a reminder that we need not feel such regret because the people we love are an active part of our lives as long as we live their dreams and make them proud. 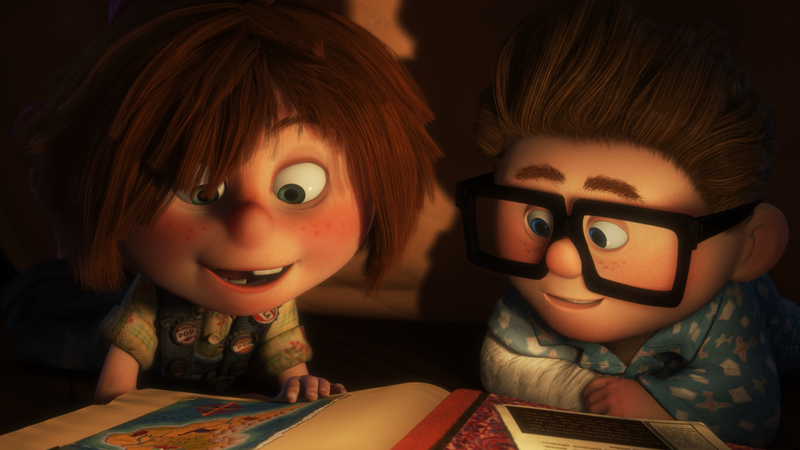 To begin with in Up we get introduced to Carl and Ellie as little children. Carl is watching a filmstrip about Charles Muntz his hero. He tells the audience “adventure is out there”. This energizes Carl and he gets a balloon which is a hint of things to come. On his way home he finds a girl named Ellie in an abandoned house. She also loves Muntz and dreams of going to Venezuela and seeing the Paradise Falls. She chronicles all her dreams in an Adventure book and has a section called ‘Stuff I’m Going to Do’. This is another theme of the movie- adventures and the power of big dreams to motivate us whether they are accomplished or not. Ellie tells Carl he must take her to Paradise Falls ‘cross your heart. Cross it!’. Then we see what happened with that promise. A full life plays out and this is my favorite section of film ever. If you think of it from both the journey of a couple, of a life, and from Carl’s perspective of not keeping his promise to his beloved it is so moving. I’ve seen it so many times and it still makes me cry each time. The thing is about regret is it can make you bitter and resentful. 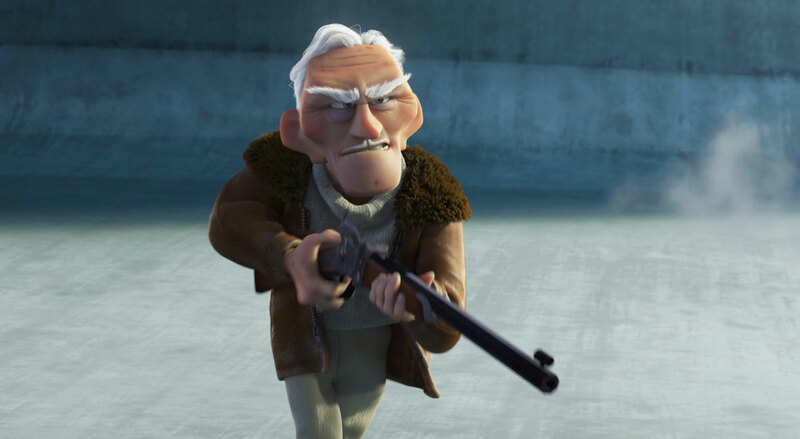 So has happened to our elderly Carl. He is lonely and talks to Ellie as if she was sitting right beside him (I love that throughout the movie because I believe the dead are with us cheering us on). A commercial developer has taken over the land near his house and they want him to sell. He tells him “you can have the house…when I’m dead”. You get the feeling he is just waiting to die and he see’s Ellie’s ‘Stuff I’m Going to Do’ and is overwhelmed with guilt at never having taken her to the Falls. Through various contrivances he is going to be forced to assisted living but he decides to instead embrace the spirit of adventure and use a million balloons to take his house to the Falls. This is so beautiful when it is first taking flight. Unfortunately for Carl he is not alone in the house but his neighboring boy scout Russell is a stow away. 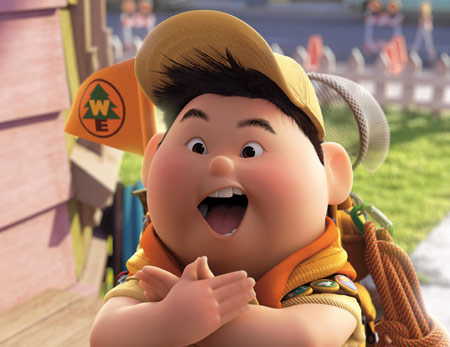 Russell is a lonely but eager kid who wants nothing more than to get his final badge in assisting the elderly. There’s some dangerous weather but they eventually make it close to the Falls where they come in contact with a rare bird and some talking dogs! Some people don’t like the dogs. I do and think their fascination with squirrels is very funny especially when their voiceboxes go bad. 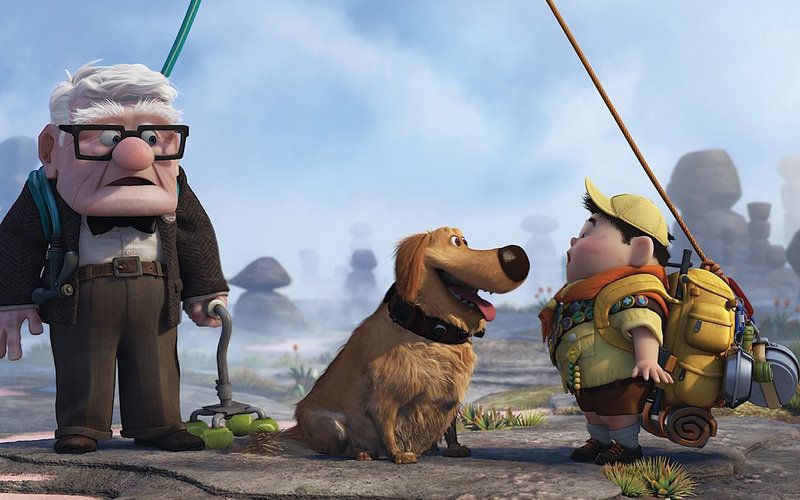 The most friendly dog is named Dug and he bonds with Carl and Russell quickly. 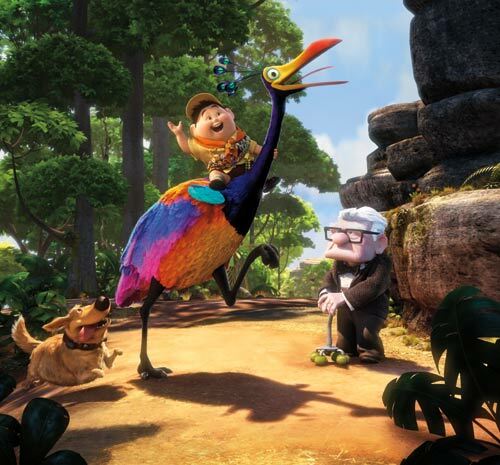 Russell names the bird Kevin and it turns out it is the very bird that Charles Muntz has been hunting all these years. Carl gets to meet Charles Muntz and it turns out he is not the hero of his youth any more. Originally they were planning on the eggs of the bird be youth serum for Muntz but it was taking up too much of the plot so they decided to leave the Muntz/Carl plothole feeling audiences would forgive them one such problem and for the most part they do. I certainly do! Plus, our villain Charles Muntz is voiced by the great Christopher Plummer so I can’t complain about that. The key is through all of these adventures Carl never looses his purpose of honoring Ellie. He talks to her throughout and is even willing to abandon Russell in order to get the house to the Falls for his beloved. I just love that. Again, you can feel the weight of his grief melting as he goes on this adventure. 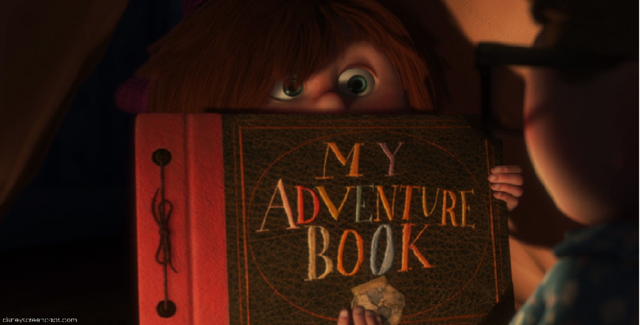 And then he looks at the Adventure book and see’s for the first time a note from his wife. Here’s the scene in French but you get the idea. “Thanks for the adventure. Now go have a new one”. Make my heart melt. In that moment Carl knows he did keep his promise to his Ellie and to me that is just as moving as the opening section. I cry every time (like literally I just watched it again and cried). He forgives himself and has a whole new energy to go and save Russell from Muntz. It’s a perfect scene in my book. To me Up is a perfect movie. The emotional journey Pete Docter takes you on should be something anyone who has lost a loved one can relate too. I certainly do. Every time I watch it I feel like I get a hug from my Grandpa who I miss everyday of my life. He was my hero and I hope he is proud of me and my little life adventure. It’s not only incredibly moving but also funny and sweet. We get a lot of humor from the dogs, Russell and Kevin. The relationship between Russell and Carl is sweet and grows organically through the story in a believable way. 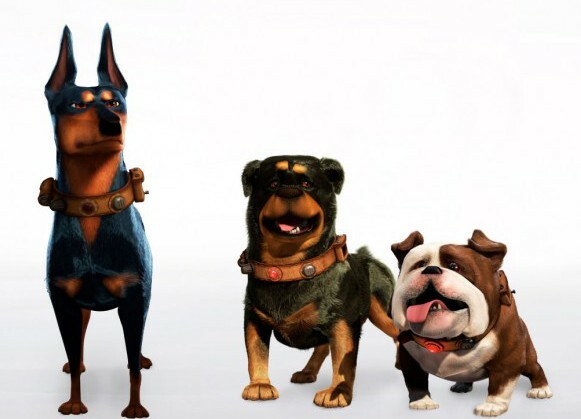 The voice performances from Ed Asner, Christopher Plummer, Jordan Nagai, Bob Peterson and others are first rate (how has Ed Asner managed to play the grumpy old man for the last 40 years!). And the music by Michael Giacchino is one of my favorites in all of movies. It is literally pitch perfect. It is obviously not the most realistic stories. For instance, it would take much more than one night to blow up all those balloons but if you can just go with it you are in for something special. The script is the typically witty dialogue of a Pixar movie. It is funny and sweet and will take you on a journey if you will let it. 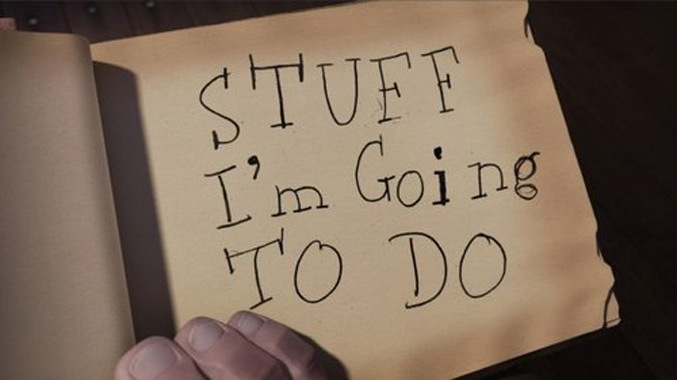 Ever since Inside Out I’ve been thinking about Up and how both movies are about memories. How we deal with those memories and not have them become debilitating is a challenge whether you are 11 or 71 (or however old Carl is!). And I just love how we learn in Up the adventure of life is the greatest tribute we can give those who have past on. We never forget but we keep on living and embracing whatever comes our way! It’s the spirit of adventure! It’s so rare a movie will teach you something about life and be a true moment of clarity. Those films are more than just entertainment. They are practically scripture in my life. Up is such a movie. It teaches me about loss, love, marriage, grief, adventure, life and everything else. 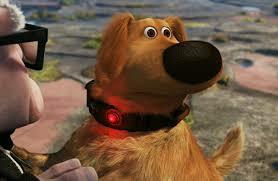 So yes Up is my favorite movie. It is a movie I could watch every day for the rest of my life and never get tired of. It’s just that kind of movie to me. Something that comes around a couple times in a person’s life and is a true inspiration. Thanks to the entire Pixar team for making such a beloved movie! The main reason I nowadays put The Incredibles on the Top Spot and not Up is because I can watch The Incredibles at any given day. But Up, as much as I love it, I rarely watch. But it is a masterpiece, especially the first minutes. Easily some of the best animation has to offer. I can see what you are saying. The Incredibles is probably more rewatchable in certain ways. They are both so great and so different. I totally agree both some of the best animation has to offer. According to promotional material Carl is 78. Russell is 8. Cool. Thanks for that clarification. No problem. Now, let me ask the question I’m sure we’ve all been wondering: Do you like this movie? Great review. And awesome cake!!! 🙂 The beginning of Up is an absolute masterpiece. I can’t make it through that without crying like a baby. Why can’t non-animated movies be as good as Pixar films?! I feel this same way about WALL-E – that’s one of my all-time favorite movies (including non-animated films). The beginning of that is also a masterpiece. I do think both these movies lose their way after their openings, though. I wish both lived up to their starts but I suppose it’s hard to maintain such brilliance for two hours. They are amazing beginnings. I think they do maintain it but I know many feel as you do which is cool. I think the difference with Pixar is they literally spend years pouring over these scripts and ideas where many other movies are rushed into production. I just read Creativity Inc about the history but more the process of Pixar. So fascinating. I highly recommend it. Walle and Up are just special films. True labor of loves. I know. I would love to work there. Wait until we meet in real life, then you’ll have met someone who doesn’t really like this movie all that much, lol. Ha. Seriously what’s wrong with you! What a great movie, and I love how passionate you are about it. 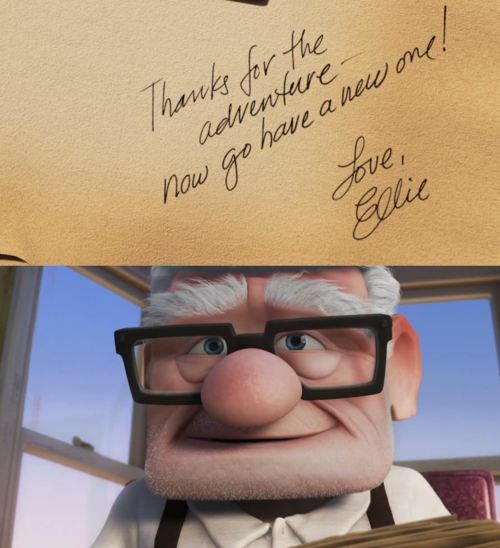 That cake is great too 🙂 I think I teared up a little just looking at that screenshot of the note Ellie left for Carl. Someone else mentioned re-watchability, and while Up is one of my absolute favorites I think I would agree that it’s one I can’t watch all the time because I know it will make me cry. And I have to be in the mood for a cry. It’s true. I do have to be ready to cry because I like you tear up at even the images (anything that makes me think of my Grandpa will do that to me and he’s been gone 14 years. Still miss him so much). Again, great review! I so give this one an A+ as well. I was shocked to find out that both this film and Inside Out were directed by Pete Doctor. Both are great and brilliant films. This film is likely a little better, but so enjoy both films nonetheless. I’m glad this one won an Academy Award for Beat Animated Feature. Pingback: Pixar Review 26: Day and Night | Reviewing All 54 Disney Animated Films And More! Some people claim that there is one major plot hole in that the old Muntz would probably be dead by the time Carl was an old man – but here’s the switch; Muntz was probably in his mid twenties at the time, and Carl was under ten years old maybe eight or nine, fast forward sixty years and the age gap doesn’t seem so ridiculous – problem solved! 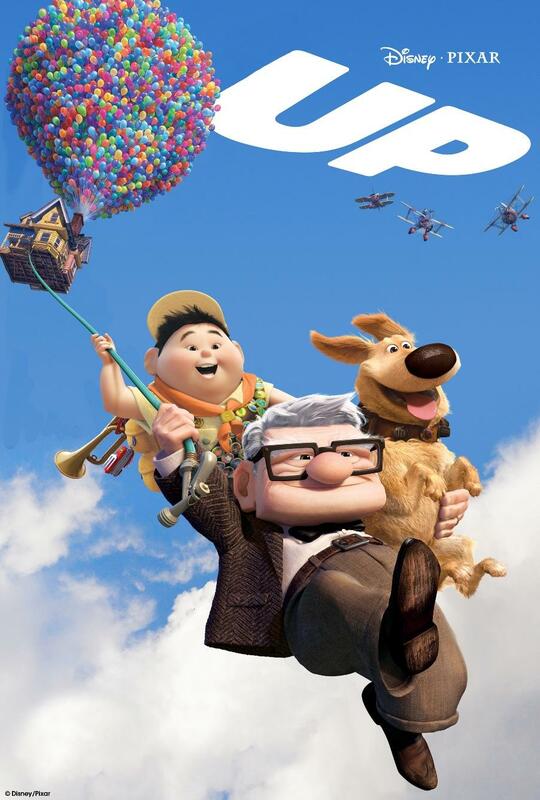 Eliminate that one “flaw” and you might just have a perfect film, and that’s what ‘Up’ is to me, my favourite Pixar film and a perfect 10/10 film. Well and if you read Creativity Inc Ed Catmull says they were originally going to have Muntz use the eggs from the bird to keep him young but it was too distracting to the plot so they went with it knowing it was a bit of a plothole. They thought the movie was good enough people would let that slide and I agree. I think your solution could also be right. It certainly doesn’t bother me either way. It’s a story and it is so magical. I love the opening but also feel the ending when he see’s the additional pages from Ellie is so moving. I literally tear up just thinking about it. I also agree it is so funny and I love all the characters and vocal performances. My favorite movie. Favorite animated film. Favorite Pixar film. It has a great story, it’s bold and different and it moves me and makes me think of my Grandpa every time I see it. 10/10! 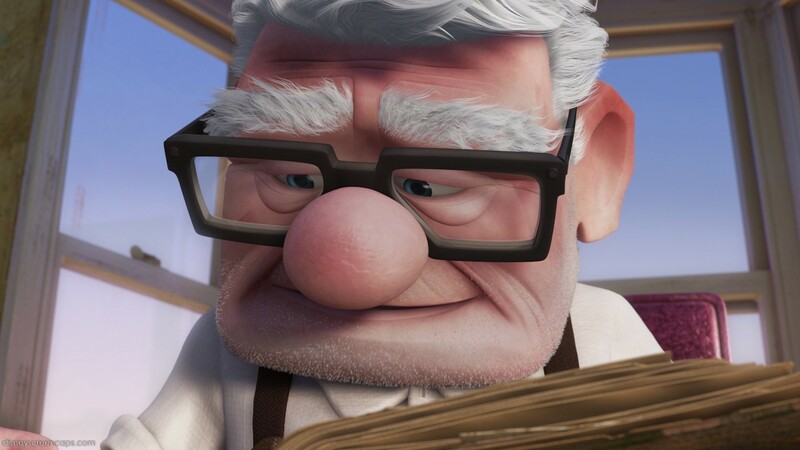 I just recently watched Up again, and I will say that it is nice that they focused on memories, heart, and adventure to be the main focus on the film. It is very touching. I won’t say anything else for obvious reasons.